Currently at a training for work; it’s sort of my worst nightmare–two full days, eight hours each. PowerPoint presentations, group exercises, too much AC, highlighters, easels with big pads of paper on them, trivia questions to relieve the boredom. Fortunately we’ve been given cardboard and markers so that those of us who “learn by doodling” can indulge our passion. Here’s doodle #1. 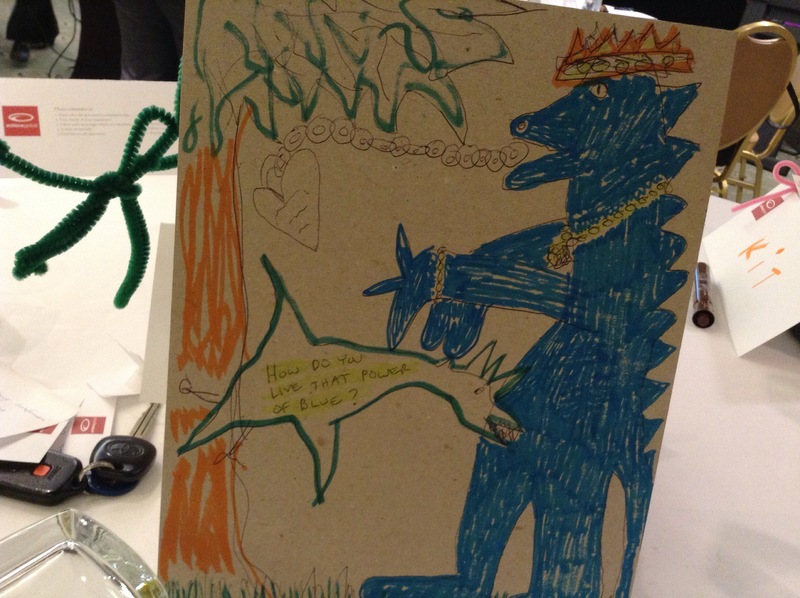 It started out completely innocent, but when it was done my table mates managed to read lurid content into it. Now I feel dirty. But I like it, too, even if it does look like a pterodactyl fellating a T. rex. This entry was posted in Outings, work on May 13, 2014 by thumbstumbler.